The world's most far-flung football tournament? (CNN) -- When FC Seoul played Umm Salal at the Qatar Sports Club in Doha on Wednesday, it marked the half-way point of a remarkable 14,000 kilometer round trip for the Korean club. Luiz Filipe Scolari hopes to steer his Uzbek team into the Asian Champions League semi finals. But when it comes to the Asian Champions League (ACL), the largest, most populous club football tournament on the globe, mammoth journeys are to be expected. That is because the 46 territories that make up the Asian Confederation -- an area that covers over half of the world's population -- stretch from Australia in the east to Qatar in the west. But despite the competition including teams from the emerging world powers of China, India and Iran -- much of the world media's focus remains fixed on the UEFA Champions League, South America's Copa Libertadores and the African Champions League -- leaving the Asian format somewhat under the radar. Can Asian football ever compete with the game in Europe? The remaining eight teams that are competing in the quarterfinals -- Kawasaki Frontale, Nagoya Grampus, Pohang Steelers, FC Bunyodkor, FC Seoul, Umm Salal, Al Ittihad, Pakhtakor Tashkent -- must also compete with bigger clubs from Europe for the attention of domestic fans. Who are the Asian football stars? With an almost religious following for teams in La Liga and the English Premier League across Asia, clubs like Manchester United and Real Madrid have wooed sponsors and TV audiences with preseason tours in South Korea and China, among others. "[The ACL] is a long way behind Europe's version...the world watches the UEFA Champions League [but] what we need is for Asia to watch the ACL,' explained John Duerden, Goal.com's Asia editor. "The potential is huge and the challenge is converting some of the hundreds of millions of football fans in Asia into Asian football fans. It is happening, slowly." The ACL is the region's attempt at fighting back, by trying to attract fans enthralled by big-money foreign leagues abroad and proving that the region's football can stand up to scrutiny in its own right. Rebranded in 2002, the Asian Football Confederation (AFC) has pumped millions of dollars in to a tournament that now involves 32 teams from the shores of the Mediterranean to the Pacific east coast. Michael Church, World Soccer's Asian football expert, thinks there has been progress: "The number of fans attending ACL games has increased this year. The AFC is putting significant amounts of money into improving the ACL, rewarding the teams for success and that, in turn, is paying off." One man who has many of the hopes of Asian football on his shoulders is Brazilian coach Luiz Filipe Scolari. After the World Cup-winner was sacked by Chelsea he chose to become coach of Bunyodkor in Uzbekistan, a team awash with cash from the country's recently found gas and oil wealth. 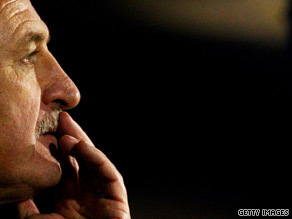 The move to the former Soviet city of Tashkent made Scolari the world's highest paid football boss, with an annual salary of just over $19 million; consequently expectations have risen. Domestically form has been good for Bunyodkor, with goals from Brazilian legend Rivaldo leading to 23 wins from 23 games, but in the ACL Saudi Arabia's Al Ittihad standi n the way of a place in the semis. If Scolari can pull off a Champions League title for his side Bunyodkor will qualify for the FIFA Club World Cup, a key competition to raise the profile fuerther. "A key development of the club game in Asia has been the implementation by FIFA of the Club World Cup, which means clubs have a realistic opportunity of playing against the best from Europe and South America," explained Church. "The impact of that shouldn't be underestimated." If Scolari can make it to Abu Dhabi in December, he won't just be back mixing with the game's managerial elite. He'll also be putting Asian domestic football on the map for the right reasons.